Ducati Multistrada 1260 prices start at Rs. 15.99 lakh (Ex-Showroom) and the top end variant Ducati Multistrada 1260 Pikes Peak is priced at Rs. 21.42 lakh (Ex-Showroom). Ducati Multistrada 1260 is available in 4 variants and 6 colours. Share your experiences with Multistrada 1260? The best way to judge your riding comfort is by taking a test ride of it. And always remember don't let height keep you from getting onto a bike. Ducati has been tweaking the Multistrada’s recipe to make it a better all rounder. Is the transformation complete with the new 1260S? The Multistrada 1260 is the range-topping model of the Multistrada family. Ducati is yet to launch the motorcycle in India. But if it does, the bike would rival the recently-launched 2018 Triumph Tiger 1200. 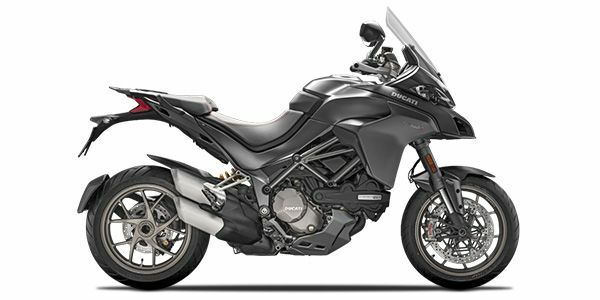 The design of the Multistrada 1260 has the typical bulbous front that sits high over the long-travel upside down forks. Twin air intakes dominate the portion below the alien-like twin LED headlamps. The front side fairings have been redesigned for better aerodynamics. The Italian marque has tuned the dimensions of the motorcycle to make it more stable and comfortable, even with a pillion rider. Ducati has made sure the powerplant is usable as well, with oodles of low-end torque. Overall, the Multistrada 1260 is a more of a tourer than a sports bike on stilts, which the previous model was famed for. Powering the Ducati Multistrada 1260 is a 1262cc Ducati Testastretta DVT L-twin engine. Mated to a 6-speed slipper clutch enabled transmission, this powerplant produces 157.9PS at 9500rpm and 129.5Nm at 7500rpm. The torque delivery from this new motor is brisk at low revs. To keep things under control, the Multistrada gets cornering ABS, Ducati Traction Control, Ducati Wheelie Control, Vehicle Hold Control, Cruise Control, riding and power modes. The Multistrada 1260 is a more civilised motorcycle than the erstwhile model. The power delivery is a lot more calmer and the bike leans more towards practicality rather than outright sportiness. This demeanour will appeal riders who crave for a friendly yet powerful and versatile motorcycle. Motorcycle News Of The Week: Motoroyale Launches 7 Motorcycle, New Jawa Engine Revealed, Royal Enfield 650 Twins Launch Date Confirmed & More!